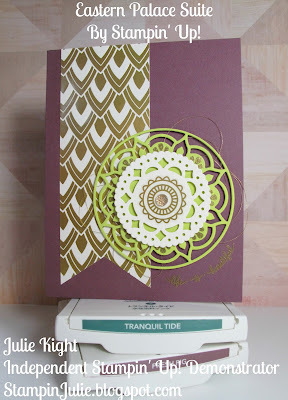 My first card I made with the very traditional colors that match the DSP( Designer Series Paper) in the suite. What I really love about this suite is all the GOLD! It is so pretty and sparkly. 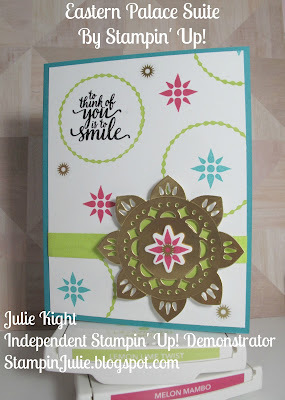 I used the Eastern Medallions Thinlits Dies to make the element on the card along with the Layering Circle Dies. They pretty much go hand in hand. If you don't have the Layering Circles I would definitely order them too! I placed one of the Vinyl Stickers on it along with the new Gold Faceted Gems that will be available on June 1st! Make sure to check out the bottom of this post for a special offer with these gems too!! to stamp the sentiment so I thought why not continue the gold theme. 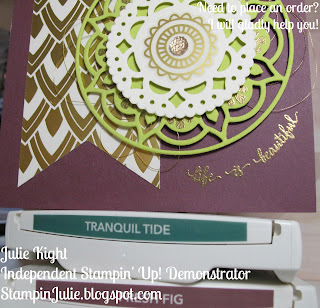 I used the Gold Embossing powder and the Heat Gun. Also, I would highly recommend getting the Embossing Buddy as it helps so much with stray powder from sticking to your card and looking sloppy when you heat it up. I used the Triple Banner punch to trim the bottom of the banner made from a piece of the specialty paper from the DSP. Great punch as you can banner punch any length of paper up to 2" wide. time. It gives it a real finished look too. The second card I made I used a little more non-traditional colors though still very pretty. 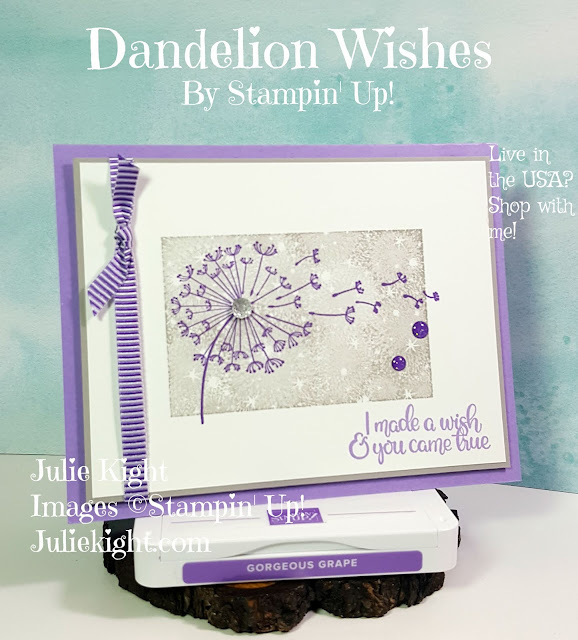 I used a different die this time for the element, along with some new ribbon from the new Stampin' Up! catalog coming June 1st in Lemon-Lime Twist. I am LOVING this new In-Color!! This makes loosing Mint Macaron and Watermelon Wonder a whole lot easier. Lol. I used more gold on it too. I wanted more bright and cheery, plus a way to show that you don't need to just use the colors of the Suite on your projects. Think outside the box! This color combo is so amazing together! Lemon-Lime Twist was meant for our stamp pads. Definitely a color that is "In" right now. It reminds me of my favorite Disney character Tinker Bell. 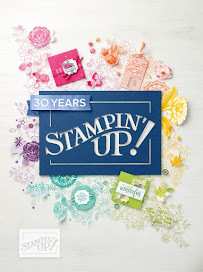 I also used one of the sentiments from the Eastern Beauty stamp set along with the various star and circle stamps. I then placed a few Gold Vinyl stickers around the card front. These come in both bundles and you get two of each sheet for a total of four sheets. But if you like them as much as I do you will definitely want more of them come June 1st. 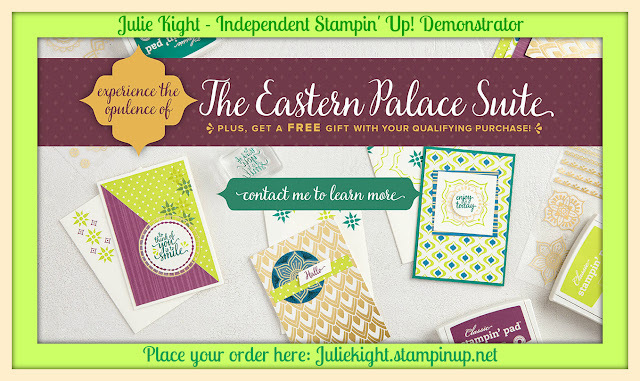 These are amazing too as they coordinate with the Eastern Medallion Thinlits dies as well. 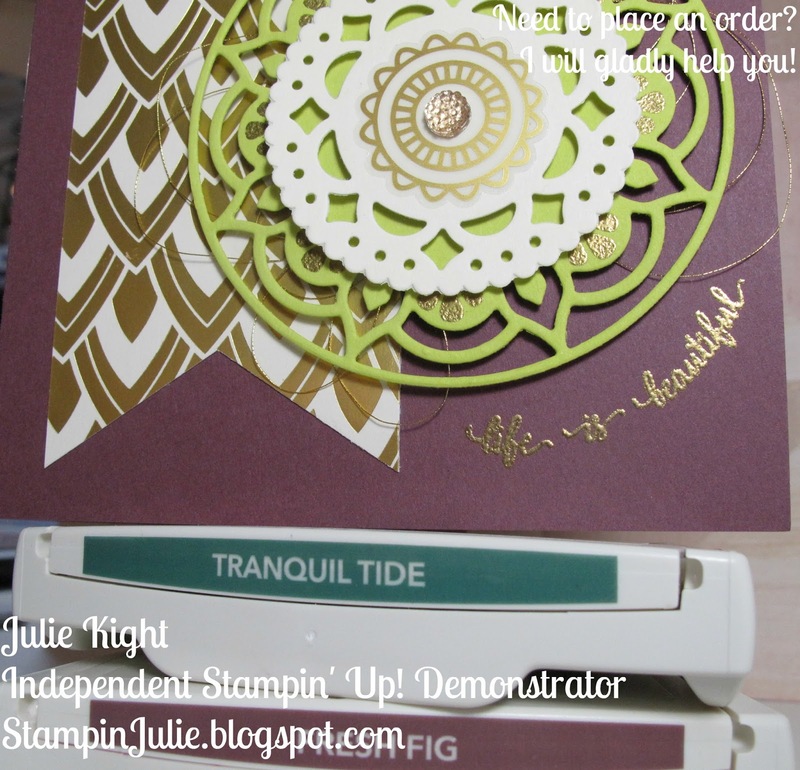 Here are the supplies I used to make these two cards. Thank you so much for coming to blog post and checking out my cards. I am trying now to post more often, at least three times a week but please don't hold me to that. When you deal with chronic pain you play it day to day. 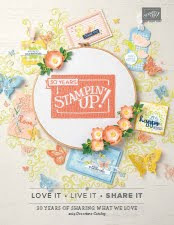 I am going to post Stamp Suites, various challenges I join, techniques I find fun to do, different stamps in the new catalog, Paper Pumpkin kits and such. If there is anything you are interested to learn more about, please let me know in the comments and I will try to do a post about it maybe along with a video too! Thanks again! !